When it comes to Xmas in Toronto there are so many different events to enjoy. We wanted to help make it easier for you to plan ahead so we’ve created this list of the best things to do this holiday season. Don’t forget, you can check out our amazing restaurant guide too if you are planning to book a table for a family get together or for a surprise treat or even as a way to end a perfect Christmas themed day. Every year our holiday guide is a big hit and this year should be no exception. We have all our favourite events lists as well as some great new treats for all our readers and they are all listed below so you can find them at a glance. Xmas at Black Creek:There are a number of great events being organized at the Black Creek Village this year where you’ll be able to celebrate Christmas and experience all the old and new traditions and have a great day out. Family Xmas Weekends: This family experience will allow you to step into an amazing Christmas wonderful. Experience the sights and sounds of a Victorian Christmas and enjoy some wonderful seasonal activities in the village. Who knows, you might even pick up a new tradition or two to add to your family’s holiday festivities for years to come. Storytime with Santa: Happening every weekend in December, this is a special treat for all the little ones. They get to spend time with Santa and his helpers as well as gather around Santa’s chair and listen to him tell a classic Christmas story. Children also get to decorate their very own Christmas cookies in the historic kitchen and grownups can warm themselves with a hot apple cider. Remember to bring your camera to capture the memories of this wonderful experience as you create your very own Christmas crafts and explore the holiday village. Christmas by Lamplight: This takes place every Saturday in December as Black Creek comes to life in the evenings with music, food, and activities all beneath the glow of lamplight. Bask in the glory of the holiday decorations and enjoy an evening of fantastic music and Christmas entertainment. Toronto Christmas Market: This is something not to be missed. 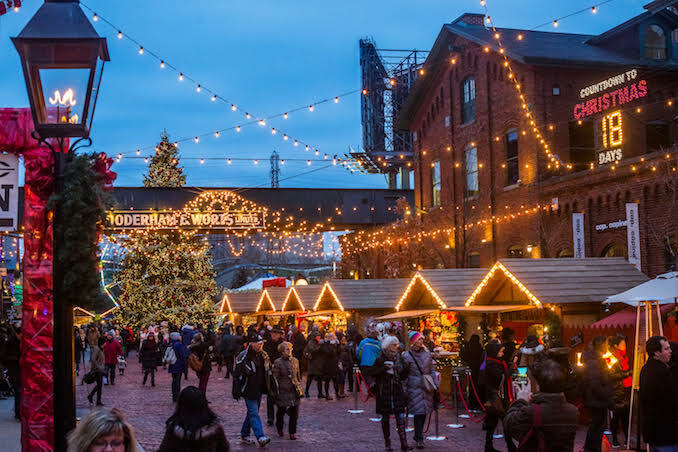 Toronto Christmas market is one of the leading Christmas markets in the world and the annual event brings with it all the tradition, heritage, and charm you’d expect to find at a Christmas market. It’s also where you’ll find unique local handcrafted products and gifts for all the family. The day is filled with friendly entertainment, musicians, carolers, children’s choirs, and holiday-themed stage productions. There’s even a visit from Santa and his elves to enjoy. The Market is held right up until the 23rd of December and opens from 12pm to 9pm weekdays and 10am to 10pm at weekends. Bloor Yorkville Holiday Magic: This is the annual community concert event that supports the Canadian Foundation of AIDS Research (CANFAR) and it’s free. It features the official “Flick the Switch” lighting ceremony along with exciting live music performances from some of the best Canadian stars. Illuminite: This is a wonderful evening of music and dance where visitors get to experience the wonder and joy of the holiday season in the heart of Downtown Toronto. There’s live music that will have you dancing as well as a special tree lighting performance followed by live singing in the square of all your favourite Christmas songs. Fallsview Casino Resort Entertainment: Fallsview Casino resort features some of the best in entertainment for your holiday seasons with over 250 shows every year. This includes some big international stars like Steven Tyler, Adam Sandler, Kelly Clarkson and more. You can enjoy blackjack, roulette, slots, and more while catching a show too. There are a number of land-based casinos in Toronto but if you don’t want to travel, there are online casinos and Torontonians can play online casinos here and enjoy all their favourite games for real money prizes. Toronto Santa Claus Parade: What’s Christmas without Santa Claus? Take your kids to this event where Santa is welcomed into town. The parade is the highlight of the Toronto Xmas Events calendar and has been in operation since 1913. You’ll get to see amazing floats leave the corner of Christie and Bloor Street accompanied by marching bands, dancers, and a myriad of characters all dressed up as they lead the way along the 5km route. The parade lasts for approximately 2.5 hours and starts at Christie Pits Park and ends at the St. Lawrence Market. Swedish Christmas Fair: This is a two-day holiday event that includes children singing carols at the Lucia Pageant as well as the story behind the IKEA founder Ingvar Kamprad. You can try your hand at folk dancing, craft making, and more. You even get to try out some of the delicious Scandinavian foods and drink glogg. There’s a range of imported handmade gifts, unique Christmas decorations, and much more. Cavalcade of Lights Toronto: This is a free event that has been running for more than 50 years in Toronto. It marks the official start to the holiday season and features the illumination of Toronto’s official Christmas tree. Musical performances by some of the top Canadian talent as well as a fireworks display are not to be missed. And there’s a DJ skating party in the outdoor rink as well. It’s fun for all the family and takes place in Nathan Phillips Square. The Nutcracker: If you want to enjoy a family Christmas classic, the Four Seasons Centre for the Performing Arts is a must visit. Running until the 30th of December you can see the stunning Nutcracker come alive on stage in this visual extravaganza. As you can see, when it comes to Xmas in Toronto there really is so much to fill your schedule with. From treats for the kids to family fun and casino entertainment for adults, there’s something for everyone to enjoy this holiday season.